Some people live in a square world, but for us who live in a drafting world, there are angles galore. Luckily for us, when we bring blocks into our angled drafting environment, we no longer have to use the ROTATE or ALIGN commands. Some may be intimidated by dynamic blocks, but don’t worry, this will be a pain-free intro into dynamic blocks. Let’s start. Insert the block, select the block, right-click and select “Block Editor” in the right-click menu. For some, this is new. The block editor allows you to edit your block without exploding it. This is especially great for editing blocks with attributes. Don’t close the palette that is on the left of the screen. This is the ”Block Authoring Palette” and we need this to apply the dynamic functions to our block. The tab on the “Block Authoring Palette” that we need for this project is the “Parameter” tab. 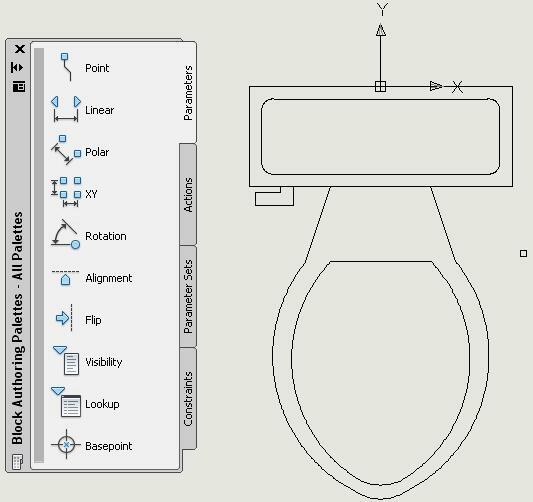 Now use OTRACK and track up from the mid-point of the back of the toilet 2 inches. To do this, hover over the mid-point of the back of the toilet. Hovering over a point activates the OTRACK. Now pull your cursor up and a dashed line should appear. This is your “TRACK PATH.” Type in 2 . This is the starting point for our alignment. Move the cursor to the right 90 degrees. Your cursor should say zero degrees. · Simply click anywhere to the right as long as it as at zero degrees. That’s all that we need to do in the block editor, so close out of it by clicking the “close” button to the far right in the ribbon. A dialogue box will pop up and ask you to save the changes to the block, click the option to save changes. Now that we are done if your block is in your drawing or if you insert the block, select the block. You will notice that the insertion point for the block is now not even touching the block. This is correct. We don’t want our block to be have its back line overlap the wall. When you now insert or move your block (from the grip) it will align itself to any angled wall ! ! This entry was posted in Blocks, Customization. Bookmark the permalink.